Everything to know about the state's HR, payroll, and benefits rules. Out of all the places to practice HR in the country, few are as challenging as New York. 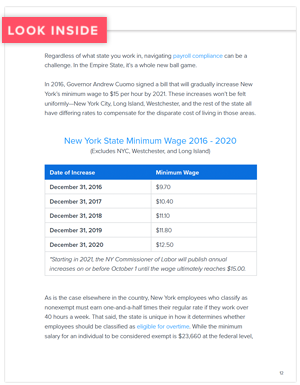 From the state’s robust paid family leave mandate to its annual minimum wage increases, the Empire State has always led the pack on progressive, pro-employee legislation. In other words: if you can make it there, you can make it anywhere. Whether you’re an HR professional in Brooklyn or in Buffalo, we’ve put together the latest HR, payroll, and benefits challenges you’ll face this year.